A virtual wedding ceremony can bring a wedding date closer with little planning, and bring friends and family from all over the world together to witness the event. There are two ways to enjoy a virtual wedding: In a chat room or in a media player like Windows Media Player (webcasting). If you go the chat room route, there will likely be a cap on your number of guests, but they will be able to communicate too. There could even be graphics like those found at CCON.org, from the first virtual wedding in history, May 8, 1996. The webcasting route takes viewers to the live scene of your wedding, with all of its floral beauty, verbal vows, and the works. However, your guests can only watch - they can't talk back. You could always schedule a chat afterward if desired, either after or even during the live reception. You'll have to propose, of course. You can even do that online. Come up with a guest list. They'll need internet access, of course. You can e-vite them, or if you wish, send snail mail invitations for keepsakes and old fashioned flair. You may still have to send out email invites to include ID numbers for your guests. They may be required to enter them at the virtual chapel to get in. You still need to set a time, date, and place. If you go the webcasting route, you'll have to plan ahead for the webcast crewmember to attend the wedding. You'll have to go through the normal steps of acquiring a marriage certificate for it to be legal. You'll want to plan all the details you're interested in - attire, flowers, a special evening, etc. Why would you even want to say "I do" at a virtual wedding ceremony? Practicality and sentimentality. Or a sense of urgency, perhaps. Not everyone dreams about the day they get to put on a fluffy white dress, have their hair spun into an updo with ringlets, plan out every last detail of the day like a careful itinerary, or even share a kiss after the phrase "I now pronounce you…" Some people just aren't that into the details, but they do want to get married. A virtual ceremony is a frills-free way of doing it. Friends move. People make friends online. Why only invite locals to a ceremony? 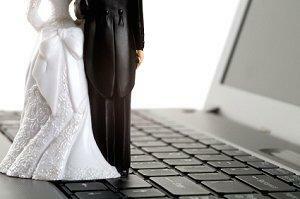 Online ceremonies offer everyone the same chance to share the special moment, no matter what their budget. It also takes the place of using elopement to keep the stress levels down, but you get to have your friends there to "witness" the event. If your friends and family would normally have to spend money traveling, they don't have to worry about saving up to attend a virtual wedding. Urgency's another reason to consider an online ceremony. Especially with the military activity--several deployments, extended tours-sometimes you just can't (or don't want to) wait anymore. Again, online chapels make weddings happen sooner than later. And most important for some couples, it's inexpensive! Online dating and socializing are huge. If you met online, what better way than to celebrate your love by getting married online too? If you tend to make friends on the web, you can invite them all, too, and you never have to give out your home address. Again, the lack of desire to plan but the wish to invite all your friends and family fit into the sentimentality category as well. You'll be "surrounded" by your loved ones-without the headaches that come with planning everything from the date and time to the arrangement of the flowers in the to-be-tossed bouquet. Wedding.rin.ru is a Russian chapel online that allows you to send a proposal, invite guests, submit photos from the big day, even get a divorce. Friends and Lovers offers the virtual I Thee Commit ceremony. You won't come away legally married, but you will get a printable certificate (which will display either the default vows or the ones you wrote to each other). There's also no one at the "ceremony" (and you have to be in the same room with your lover so that they may type in their answers, click the acceptance buttons, etc. You'll get to proceed to a virtual reception afterwards where all your friends can join you. You're there. Your spouse-to-be is there. Guests can even be on-site. However, not everyone you love can attend, but they'd love to watch you say your vows. Webcasting's a great option. You can put your wedding-live-online, and all your friends and family can tune in to watch. Live Vows is a good place to start your research. It isn't exactly inexpensive, but it's cheaper than flying everyone in! Your guest list can be unlimited. A virtual wedding ceremony can be a unique way for a couple to exchange vows, whether they opt to put the entire ceremony online or just to webcast their nuptials so everyone can share their joy.